A top university identified the need to gain access to real-time, accurate information regarding campus-wide utility consumption and facility-related equipment status. Information needs were driven by regulatory demands, as well as green initiatives to reduce energy. For example, campus-wide competitions were planned, with dormitories vying to demonstrate the greatest reduction in energy usage. This information was to be displayed via the web so students could track their progress. In addition, increased demand required the expansion of certain utilities, such as chilled water. Finally, the need to better optimize existing equipment required the acquisition of additional data that could drive optimization of equipment usage (i.e., which chillers to run). The university faced parallel demands for real-time, accurate utility data as well as an operational need for additional chilled water capacity. A well-planned strategy was required to meet both these needs as well as project-based schedule requirements. The initial, critical need was to incorporate two new chillers (one steam, one electric) and six new cooling towers into the plant chilled water distribution system. 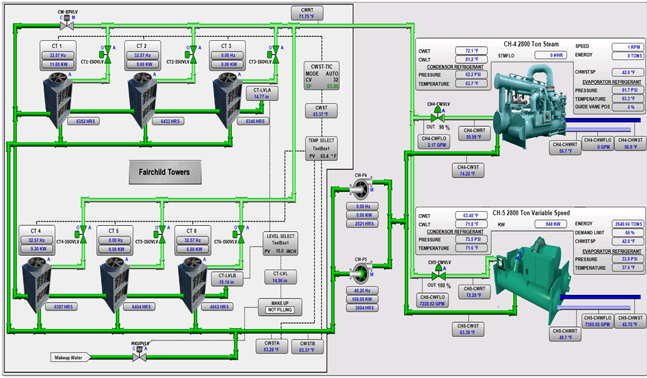 An automation system to support the new chillers and cooling towers was required; however, this system was to be designed with regulatory, operational efficiency, and green initiatives in mind. 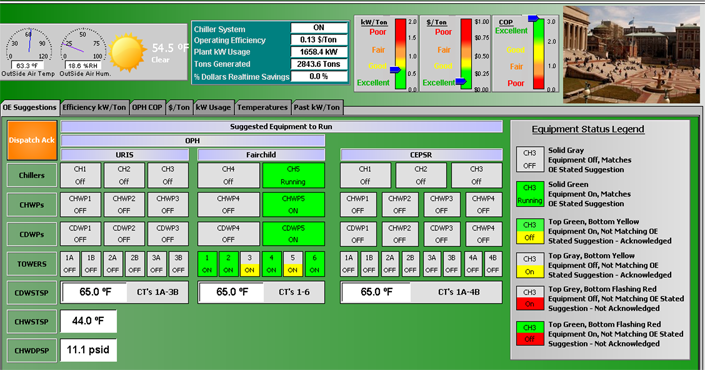 Chiller PLC – handles control and monitoring of the chiller balance-of-plant equipment and cooling towers, also interfaces with each chiller’s local controller. Utility Data Acquisition Panels collect data regarding energy usage for each building, include power, steam, domestic water and chilled water. Additional PLCs and points required to enable Chiller Optimization via a third-party package – data regarding flows, temperature, power, differential pressure, and current weather are incorporated into the data concentrator PLC. Legacy chillers – the data concentrator PLC communications via Modbus/TCP to (6) legacy chillers. This data is used to drive the chiller optimization logic. Legacy cooling towers – New PLCs were implemented on or near two building rooftops to control and/or collect data such as temperature, bypass valves, steam vales, etc., from legacy cooling towers. Automatic Transfer Switch Monitoring System – the status of automatic transfer switches handling the transfer to generator power, as well as analog data for each location (current, phase voltage, three-phase power, power factor, etc.). Let’s take a closer look at the process. The system was implemented in phases based on the customer’s schedule requirements. The initial deployment consisted of the PLC to control the two new chillers, as well as the Wonderware System Platform and Historian. Initially, the SCADA system was dedicated to data for the new chillers only. However, the data sources and functionality quickly grew, as additional points were implemented requiring either new PLCs, or additional points added to existing PLCs, for operational, regulatory, and environmental purposes. ACC’s responsibilities included the design and implementation of all automation and SCADA system deliverables, as well as the installation and wiring of new points and PLCs. In many cases, ACC specified and provided new field instruments and devices. As a result, coordination of installation and system deployment activities was critical in order to meet the customer’s deadlines. 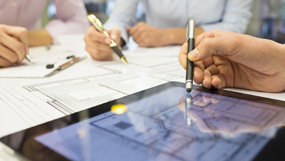 Data drives efficiency– the ability to collect facility data into a common data repository and generate reports, analysis and trends, is leading university staff to identify opportunities to increase the efficiently of their facility assess by seeing bottlenecks and hidden capacity.